More Than Photo, Less Than Video. As probably all of you already know, GIF (which stands for Graphics Interchange Format) is a widely used image format which, for its characteristics, is especially suited for web use. It was introduced back in 1987 by CompuServe, a subsidiary of AOL, one of the major online service providers in the US. GIF is a compressed format which supports a palette of up to 256 colors per image, which is incompatible with requirements of high quality photography. However, GIF supports animation, which is another reason behind its popularity. Sharing animated GIF images on the web, on social networks especially, has become a hugely widespread pastime, but creating the files from scratch, using image editing software not specifically designed for this purpose, can require more effort than one would expect. With their GIFVid, developers Eiji Nishidai (of Toy Camera Analogcolor fame) and Tomonaga Tokuyama brought to the App Store a tool for easy creation of lightweight animated GIF using the Apple iPhone or the iPod Touch (both latest generations). 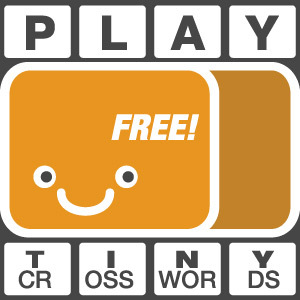 Share on Facebook, Twitter, Tumblr or send via email. 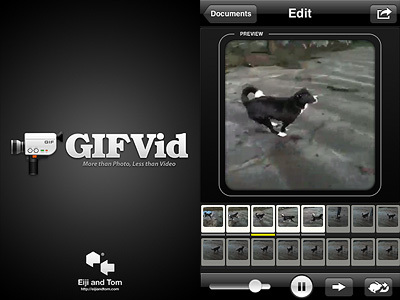 GIFVid allows animated GIF creation both by taking individual still frames and by recording short videos. In the first case, you set the time interval between shots and tap on the start button: the app will shoot as many photos as you need, until you stop it by tapping on the End button. In the second case, you simply record a video as with any other video recording app. In order to extract still frames, you can set a time interval between frames or choose the Manual mode. A third option for the creation of your animations consists in loading videos stored in your Camera Roll. GIFVid gives you several options. First of all, from the Settings you can choose file quality (from Low, featuring 16 colors only, to Best, the maximum allowed by the format with 256 colors), you can enable dithering (intentionally distributed noise to prevent pattern issues in images) and you can disable the app’s watermark. Other features you can play with concern animation frame rate, speed and direction. Last but not least, you can edit your animation by selecting and deselecting frames and by dragging and dropping them individually. Once you are done, you can share your creation by email or by uploading it to Facebook, Twitter and Tumblr. In any case, every animation is saved within the app so that you can access each project whenever you want and make changes as you see fit. Animated GIF 12.5 fps, 256 colors. Thanks to the lucky and functional combination format/sharing, GIFVid succeeds in giving iPhone casual and creative users alike the right balance between amusement and ease of use. As I said, GIF animations are all the rage on the web and this GIFVid makes everything about the process going from their creation to their sharing as easy as it can get. Of course, compared to videos, animated GIFs have a very limited scope of employ and for this reason perhaps some may find GIFVid a bit pricey for its possibilities. Compatibility: iPhone (3GS, 4), iPod Touch (4). iOS 4.1 or later.